Terrorists have hacked into an orbital banking network and are de-orbiting the satellites rapidly. Commands have originated from a failed state under rebel control. Your team is tasked to engage, secure groundstations and stop further destruction of the worlds financial system. ARMA 3: ROGUE UPLINK places you in a special PMC unit going against a terrorist group out to damage the global financial system. Things are further complicated by geopolitics, local rebels and a race against time. Development update: We've been extremely busy with the development of ROGUE UPLINK however we were delayed in areas when in the real world, geopolitics and work activity increased and therefore cut into development time between the two of us working on the campaign. 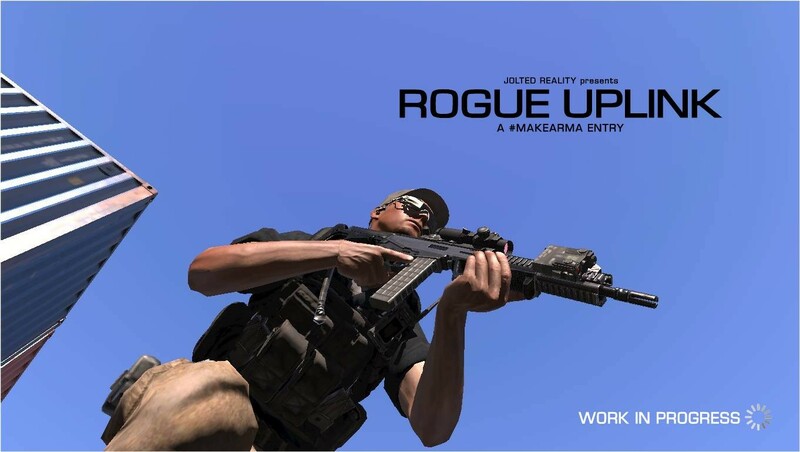 We've decided to not release ROGUE UPLINK in its current state for MAKE ARMA (though we wish we could as that prize money is amazing). We really do want to see this finished. We are going to keep working on it and release it when we feel it is ready. We thank everyone so far for their great support and votes. The ROGUE UPLINK website http://www.rogueuplink.com will have updates, images and video as development continues and be the main location for information on release. In short, ROGUE UPLINK will continue. We look forward to your continued support and wish the MAKE ARMA NOT WAR finalists good luck. We also thank Bohemia Interactive for this fantastic military simulator and the competition which has spawned an amazing amount of new content and campaigns. Keep up the great work and we look forward to sharing ROGUE UPLINK in the near future.